Fermat’s Theorem – one of the most famous and long running puzzles in mathematics is a great way to introduce proof, the history of mathematics and also to show how apparent work on an entirely abstract concept can actually drive the development of techniques which have real world applicability. The (much abridged!) story is that Fermat, a 17th century mathematician scribbled that he had a proof that the statement at the top of page was correct – ie. 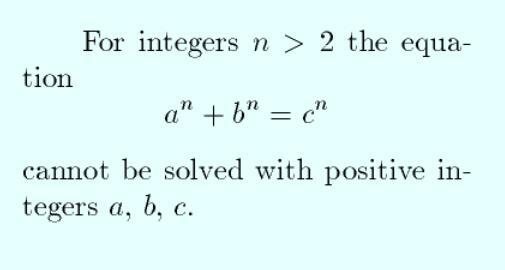 that whilst the equation holds when n = 2 (for pythagorian triples), for n greater than 2 there is no solution with positive whole numbers. Mathematicians spent the next 358 years trying to find that same proof (and now believe that Fermat was actually mistaken), before Andrew Wiles finally proved it in 1995 using mathematics from elliptical curves. A seemingly simple statement had occupied some of the best mathematical minds for over 3 centuries – everyone agreed that it probably was true – but to go from probably true, to 100% certainty – that knowledge gap required a monumental amount of effort. How many other things can we genuinely say we are 100% certain of outside mathematics?